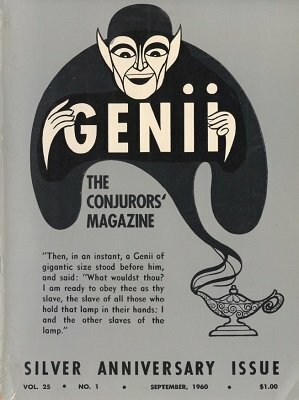 The Genii Speaks - reprint from Vol. 1, No. 1 - William W. Larsen, Sr.
On With The Show - reprint from Vol. 17, No. 11 - the last editorial from William. W. Larsen, Sr. Remarks On Close-up Magic - open letter to Gene Gordon from Lt. Col. Franklin M. Davis, Jr.
Cover - Mark Wilson's "The Magic Land Of Alakazam"
Show Review - Fifth Annual 'It's Magic' - Pasadena Civic Auditorium, Pasadena, Calif., October 21, 1960 - Bill Larsen, Jr. The Genii Speaks - WWL Jr.
Golden Jubilee Issue of M.U.M. News From Our Guildmen and Guildgals! Rare Irish Magical Bookplate - H.L. Rare Irish Litho - H.L.